‘Popups’ are short-term experiences that provide the freedom to experiment with projects on a temporary basis, allowing innovative ideas a trial run, often with an eye towards permanency. Trendwatching.com reports that 180,000 people are moving into cities daily, a rising creative urban population they refer to as Citysumers who are defining a new generation that’s more demanding, open-minded, connected, spontaneous and more try-out-prone than ever. 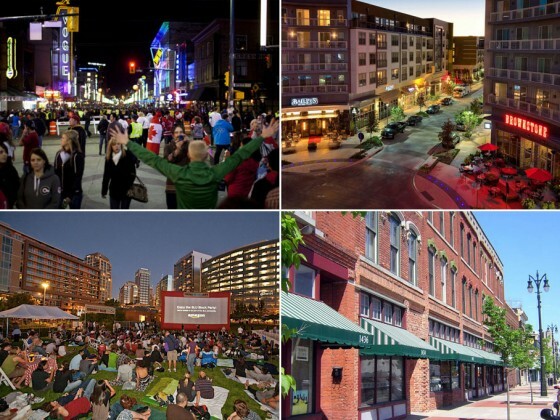 The time to experiment with forward-thinking placemaking is now. – Pop-up placemaking took off in Copenhagen in the 1950s when the City’s closing of its main downtown StrÃ¸get Street to car traffic turned public opposition into such a well-received experience, what was supposed to be temporary over the Christmas holiday has been permanent ever since. – In 2009 New York City closed Times Square to cars temporarily and found that business revenue increased 71%, injuries to motorists and passengers dropped 63% and northbound west midtown trips were actually 17% faster. It’s been closed permanently ever since. – Vancouver’s VIVA program began a roving street closing program in 2009 to test pedestrian-only places in neighborhoods throughout the city (see photo above). – Bristol, Connecticut hosted a pop-up piazza festival in August, 2011 to test out its upcoming piazza on its future site, presently within a giant parking lot. Expecting 1500 people, it attracted upwards of ten times that many. – H Street Corridor NE, Washington: Once a DC mecca, this economically challenged neighborhood is enjoying a renaissance with a collection of funky restaurants and a grand streetscaping in preparation for a trolley line. – Wynwood and Design District, Miami: Galleries, boutiques, art, fashion and chefs meet cheap rent in converted low-rise warehouses, how can you go wrong? – Fremont District, Las Vegas: Finally, a neighborhood in Vegas for the creatives. – Lawrenceville, Pittsburgh: Working class, professionals, artists, students, a design district, art festivals, over 50 locally owned eateries and ethnic restaurants. – Chelsea, New York: Rehabbed warehouses, art galleries, High Line park, authentic unique ethnic restaurants, delis and boutiques sans chains. – Wicker Park and Bucktown, Chicago: Historic Victorian architecture, trendy restaurants, bars, coffee shops, galleries and boutiques. – South Lake Union, Seattle: Paul Allen’s investment and vision, tech start-ups, new sustainable buildings and restaurants, summer block parties, outdoor movie screenings, maybe a bit too corporate for some. – Queen West, Toronto: Music venues, restaurants, bars and shops, artists and designers. – West 7th, Fort Worth, Texas: New restaurants, specialty retailers, design stores, attracting students, empty-nesters and young families. – Corktown, Detroit: A favorite city of young creatives because of its ground-up remaking, the city’s oldest neighborhood is home to artists, musicians and professionals at attainable prices. Clockwise from top left: Granville Street, Vancouver; South Lake Union, Seattle; Corktown, Detroit; West 7th, Fort Worth, Texas.